This is it: the sum total of my personal tips for tidier socks. I’m top-down, two-circs devotee, so if you’re a toe-upper, just ignore all this and take a much-deserved nap someplace. Cast on an extra stitch. Pattern calls for 64 stitches? Cast on 65. When you join the stitches to begin knitting in the round, pass the last stitch you cast on over the first stitch. It evens out the edge. 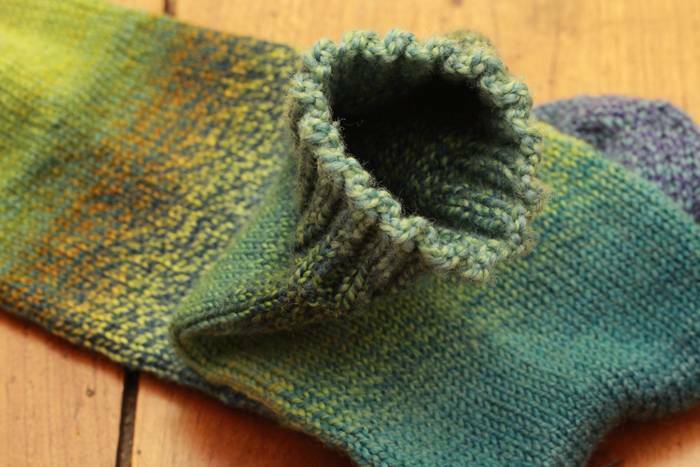 There’s usually a moment when you’ve picked up stitches along the edge of the heel flap. On the next round, knit those picked-up stitches through the back of the stitch. The twisted stitches will snug up what can be a loosey goosey moment in a sock. You’re down to the final stitches. Before you begin grafting the toe, Cat Bordhi taught me to create a smoother toe by passing the outside stitch on each end over the stitch next to it. Not only does this smooth the edge of the toe, it means two fewer stitches to graft. Score! The yarn here is Spincycle Dyed in the Wool, colorway Family Jewels. Good idea – am sure it creates a smoother edge and I’ll try it! 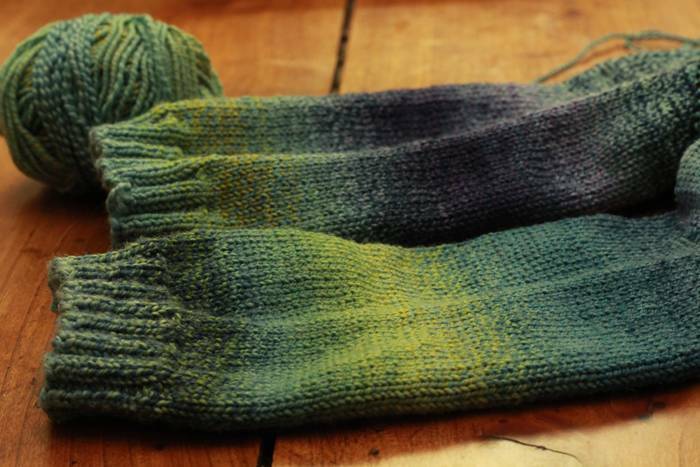 Love these tips.. I’ve knitted many socks but these 3 gems never occured to me! Thanks. Love the sock tips…..ingenous!!!! And what gorgeous sock yarn is that? That yarn is the amazing Spincycle Dyed in the Wool. Stay tuned . . . we are working on a project that is making us all crazy right now. Coming this spring . . .
Ooh–i can’t wait to see what you are coking up with Spincycle! 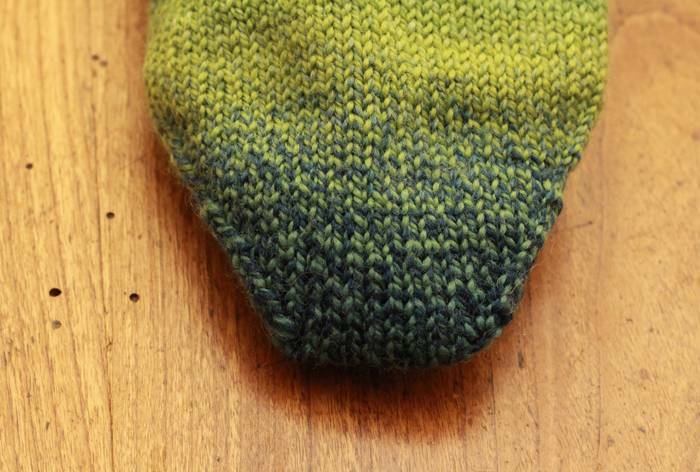 I made Spincycle socks this fall that I love, but I wish I had known these tips! Next time! Dumb question of the day ….what exactly does ‘passing the outside stitch on each end over the stitch next to it’ mean? I love Cat Bordhi, but could never figure out what she meant. I knit my socks using 1 small circ (cuff down) then switch to 2 circs (after heel flap) then back to 1 small circ, then 2 circs for toe…I must confess I use a 3 needle bind-off instead of grafting. I’ll blame it on the fact I’m left handed….sure, right, lol. I’m a newbie to your site, but LOVE it! Thanks! Same question. My working yarn is attached to one of those stitches. Though I have used the method of taking 2 stitches instead of one at the beginning and end of the Kitchener closure and that improves the toe shape. Similar to binding off; you slip the first stitch over the second one, but without knitting it first. On each end of each needle (if using double points), so on one end it will be going backwards; slipping left to right. Did that help? To clarify; this is when you have the stitches on 2 needles. Right before you Kitchener. Thanks for three great tips!! Not understanding the Cat Bordhi explanation either. Is there one in one of her many sock books I have,but too intimidated to read? although I learned to knit socks before primary school, every couple years I learn a new technique or tip. thanks for sharing Cat Bordhi’s toe tip! Great tips.I will use them all. I am not a perfect sock knitter yet by a long shot. Love your books! Another “neat” tip: Better fit for those of us with high arches! Move the gusset decreases to the bottom center of the insole. Make your double decrease, every other row, to-return-to-correct-number-of-stitches-for-the-foot by making those decreases one each side of the center bottom of foot. I keep two stitches untouched in the center, for a tidy appearance. Not original to me — this decrease echoes the shape of a foot better than doing those decreases on each side of my heel. 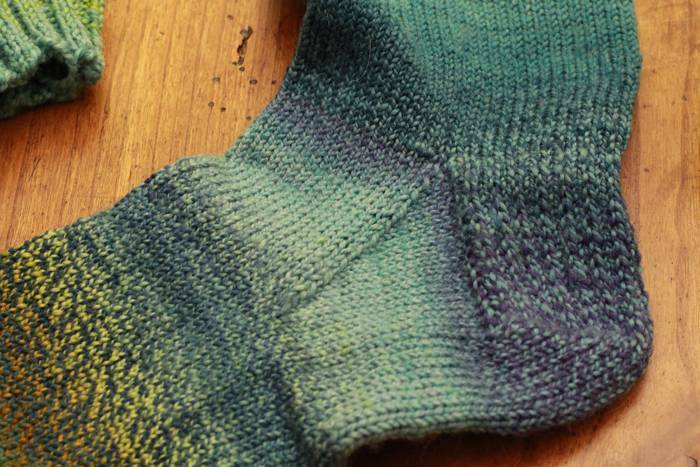 Puts those decreases on a bias so that the sock hugs your foot where it needs to be hugged.